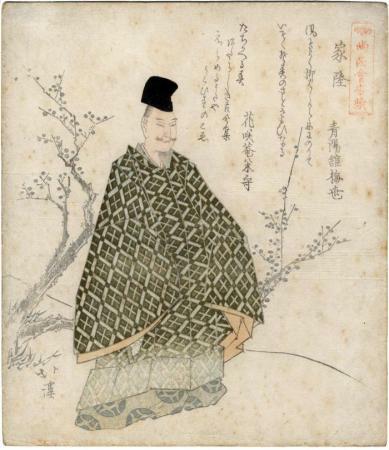 "Fujiwara no Ietaka (also read "Karyū"; 1158-1237) had the sobriquet "Mibu Nihon." He became son-in-law to Jakuren... and studied poetry with Shunzei... He was a member of GoToba's poetic circle and one of the editors of the ShinKokinshū. He has a personal poetry collection known both as the Mini Shū (after his sobriquet) and the Gyokugin Shū (Collection of Jewelled Songs). He has 282 poems in the Senzaishū and later imperial anthologies." Quoted from: Pictures of the Heart: The Hyakunin Isshu in Word and Image by Joshua Mostow, p. 430. According to the Spencer Museum the poems are by Kashōan Yonemori and Heiantei Nanatsuji.